If you’re an adult with crooked or crowded teeth, then it probably feels like you’re stuck between a rock and a hard place. You want to straighten your teeth, but you just can’t imagine facing the world every day with a mouthful of metal braces. However, with Invisalign, you can now get the straighter smile you’ve always wanted without the noticeable brackets and wires. This revolutionary treatment has already helped millions of people around the world, and it could do the exact same for you if you contact us today. 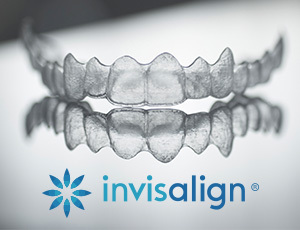 Instead of brackets and wires, Invisalign uses a series of custom-made clear plastic aligner trays to gradually straighten the teeth. All a patient has to do is wear each set of trays in the specified order, and once they have gone through the entire series, their smile will be perfectly straight. It’s just that easy! Thanks to Invisalign’s sleek and subtle appearance, you won’t have to worry about anyone noticing your dental appliance. Plus, the trays slide on and off of the teeth easily, meaning you can take them out whenever you need to eat or brush. With Invisalign, you get the best of everything, and in the end, you’ll have a beautiful smile to show for it. To learn more about Invisalign and what it can do for you, contact us today.